It's not the end of the world, but even so I will occasionally decrease the size of chat window so that I can do other things while keeping an eye on it. Tags, users present, name and description of room overlap the messages. The room name completely overflows page even after scrolling. send and upload cannot be pressed even after scrolling. The other rooms present disappear completely. Even here the problem does not fix. The upload and send buttons still overflow. It is impossible to see which other rooms I am in and the starred messages if the room description is too long. all rooms and search bar do not align. Prevent the tags, users present, name and description of room overlap the messages. Allow send and upload to be always accessible. When the window is small: resize messages so that a lot of scrolling right and left is not necessary. Hide some of the users, allow 5-10 of the currently active users to be displayed and a tab marked "See all users" that expands to show all present and add a scrollbar or drop-down of room description. Many sites can be comfortably resized, unlike the chat where resizing is awkward. 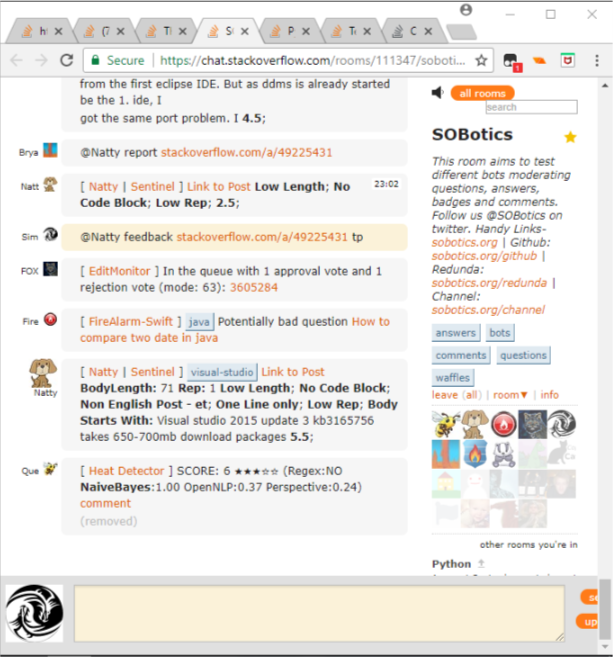 Could something be done to make the Stack Overflow chat more window resizing friendly? Also why has this not been done already and are there plans to improve the usability when in small screen in the future? Browse other questions tagged discussion feature-request bug design chat .